Pier 70 in San Francisco sits on the eastern edge of the city at Potrero Point, a small cape just south of the now-filled Mission Bay. 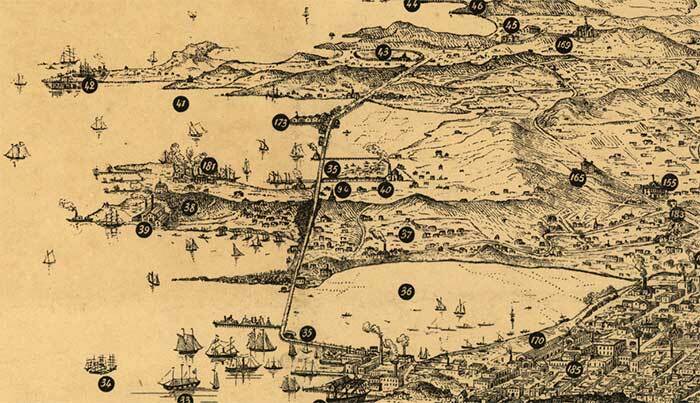 Potrero Point was once called Point San Quentin. It is a continuation of the mostly serpentine Potrero Hill. Potrero Point drew the attention of industrialists from the days just after the California Gold Rush because it had cheap land that was isolated from the densely populated city center and because of its natural deep water access. The geography of Potrero Point and surrounding areas changed drastically over the last 150 years. Industrialists and speculators sought to exploit Potrero Point's natural advantages and to overcome the obstacle caused by the swampy Mission Bay. The natural contour of the bay shore was changed by filling, with much of the fill material taken in the process of blasting away the serpentine hills that once rose above the point. 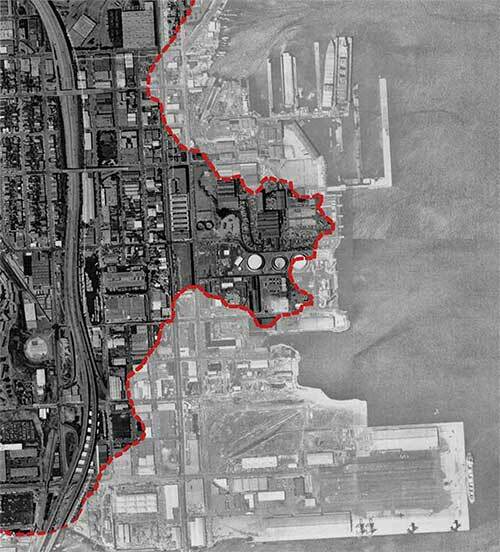 Aerial map of Pier 70 —approximate original contour of Potrero Point shown in red. 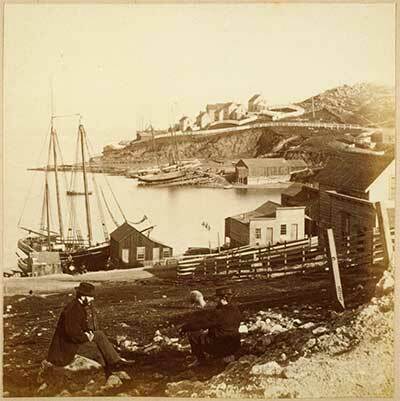 The photo below by Eadward Muybridge from 1862 shows Potrero Point (then called Point San Quentin) in the distance before the process of filling the bay and flattening the hills had begun. The hill with houses on the Point was part of Irish Hill. The geography of the bay shore, with Mission Bay cutting Potrero Point and much of the southeastern portion off from the rest of the city, led to the construction of Long Bridge in 1868. Long Bridge connected Potrero Point to the city, and extended further south to the Bayshore district. In the image below, Potrero Point is in the middle. 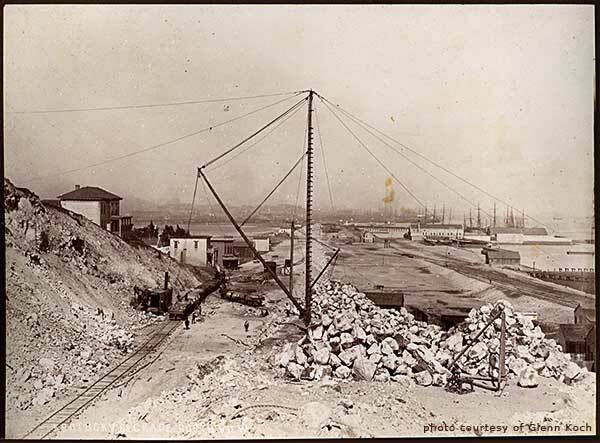 In anticipation of the completion of the transcontinental railroad in 1869, speculators flush with dividends from the Comstock mining boom began to invest in unimproved residential and industrial lands at Potrero Point. Due to its deep water access and inexpensive land, industrialists purchased large tracts of land in the area that now comprises Union Iron Works and Dogpatch. Nonetheless, speculators faced several significant natural obstacles that would have to be overcome before large-scale industrial development could occur. First, the foul-smelling expanse of Mission Bay, a large tidal flat separating Steamboat and Potrero Points, needed to be bridged to make access easier from downtown, as well as to increase land values. The first pilings for Long Bridge were driven off Steamboat Point in February 1865 and the Potrero connection was completed at near Mariposa Street in 1867. Long Bridge was extended, via Kentucky Street [now Third Street], across Islais Creek to Bayview in 1868. In the detail above from a "birds-eye view" of San Francisco from the 1870s, Long Bridge is in place and some of the earliest industrial plants on Potrero Point are already operating, including Pacific Rolling Mills (later Risdon Locomotive) and the Gas Works (later PG&E). According to VerPlanck, the process of filling the bay intensified after the completion of Long Bridge, and the government's granting of submerged lands under Mission Bay to the Southern Pacific and Atchison, Topeka, and Santa Fe railroad companies. Mission Bay disappeared completely, and the shoreline south of Potrero Point was altered dramatically to suit the intense industrial development taking place there. “Where the massive factories now stand solidly along the level shore, which bristles with its rows of piers, was once but a choice between precipitous hillsides, along which a goat could scarcely make his way, and oozy foul-smelling marshes, a mere glance at which would seem sufficient to have utterly discouraged the most progressive combination of energy and capital. *Christopher VerPlanck, from a report compiled for application for Dogpatch historical district status.